"I was ready" he said, "to kill him if he dared to insult my Satan". "Why don't you conjure up some signs also?" "Because my God is humble", the priest replied, and took out a crucifix which he had with him and asked the young man to hold it in his hand. "Now try your magic again," he said. The young man invoked Menas the initial demon once more, but Menas stood trembling, not daring to approach. He then invoked Satan, but the same thing happened: he could see the Crucifix and he wouldn't come near; he only told the young man to get up and leave for Tibet. The young man then broke out and cursed him: "I just realized", he said, "that your vast power is a pathetic weakness!" He was afterwards catechized a little by the good priest, who spoke to him about the Holy Lands, the Holy Mountain, etc. So he left Sweden and went to Jerusalem where he witnessed the Holy Light. From there, he went on to America to give the Satanists there a piece of his mind and tell them to change their ways. God had turned him into the best kind of preacher. From there, he came to the Holy Mountain. Sorcerers also utilize various "holy items"
-They are sorcerers. They use the Psalms of David, the names of Saints etc., and they combine them with invocations to demons. In other words, whereas we invoke God's help and accept Divine Grace when we read the Book of Psalms, in the way that they use it, they insult God, they reject Divine Grace, and thus the demons respond to their demands. They told me of a youth who had been to a sorcerer because he wanted to succeed in something. He read a passage from the Book of Psalms and the youth got what he wanted. But after a while, the young man began to wither away. The poor child began to melt away. What had the sorcerer done? He had taken a handful of dried nuts and began to read the 50th Psalm. When he reached the verse that said "sacrifice to God",(3) he tossed down the dried nuts, thus symbolically making an offering to the demons so that they would do him the favor. In that way, he was abusing God through his use of the Book of Psalms. -Elder, there are some who dabble in sorcery and even use the Cross, icons etc. -Yes, I know. You can tell from that alone, just how much fraud is hiding behind what they do! That's how they fool poor unsuspecting people, who see candles, icons etc. being used, and they trust those frauds! Ah, a person once told me about this Turkish woman in the town that he lived. She had placed an icon of the Panagia on top of a rock and would proclaim: "This is the rock that helps people!" She didn't say "the Panagia", but "the rock" that helps them! Christians became confused, because they would see the icon of the Panagia and when there are cases of people with a health problem, they rush over there, thinking that they will actually receive help, but the devil then wreaks havoc on them. 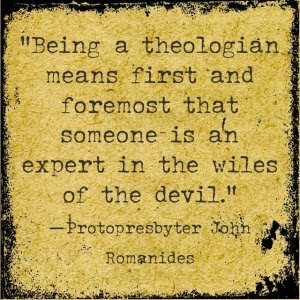 Because, when the Turkish woman claims that the rock - not the Panagia - helps people, well, from then on, the devil takes over, because the Panagia is clearly being disrespected. The Grace of God withdraws, and demon-possession takes its place. And so, Christians run to be cured by a rock - a rock AND a demon (!) - and in the end they become debilitated, because, well, what kind of help would you really expect from the devil? If they had even a speck of sense, they would have thought to themselves: "This is a Turk, a Muslim; what is she doing with the Panagia's icon?" Even though claiming that the Panagia helps, the fact alone that she is a Muslim is enough to make one wonder what her connection to the Panagia is, let alone to claim that a rock will help them! I mentioned all these things to someone, to alert the local Metropolis accordingly so that it will take the necessary measures to protect the people. -Elder, people ask us for talismans (charms). -It's better if you give them miniature crosses when they ask you for talismans. Don't make talismans, because even sorcerers make talismans nowadays, but inside them, they place all sorts of spells. People see an icon or a cross and become confused. See, just a few days ago, they brought me a talisman that was made by a Turk named Ibrahim and yet, it had a cross embroidered on it. I have been told of an ungodly individual, who takes various little icons and wraps them around items such as hairs, twigs, pins, beads(4) etc. When the Church questioned him, he simply said "I am a medium", because mediums are allowed to act freely and so he is free to do whatever he wants. I advised someone who had suffered damage because of that medium: "Go and confess, because you are subjected to demonic influences". He went to confession. Then he came back to me and said "I still can't feel any difference." "Hmm, do you by any chance have something on your person that was given to you by that deluded one?" I asked him. "Yes", he said, "I have a tiny little hollow box, something like a miniature Gospel." I took it, opened it, and found inside it a number of little icons, all folded. I unwrapped them, one by one, and inside them were beads, hairs, and something else that looked like wood splinters. I got rid of them all, and the man was released. Do you see how crafty the devil is? Poor souls - they wear talismans of that sort, supposedly to be helped, but instead they end up tormented. Those items should be burnt and the ashes buried, or be thrown into the sea, and then they should go to confess. One other time, a young man came to my Hut, who had numerous problems and was being oppressed in body and soul for more than four years. 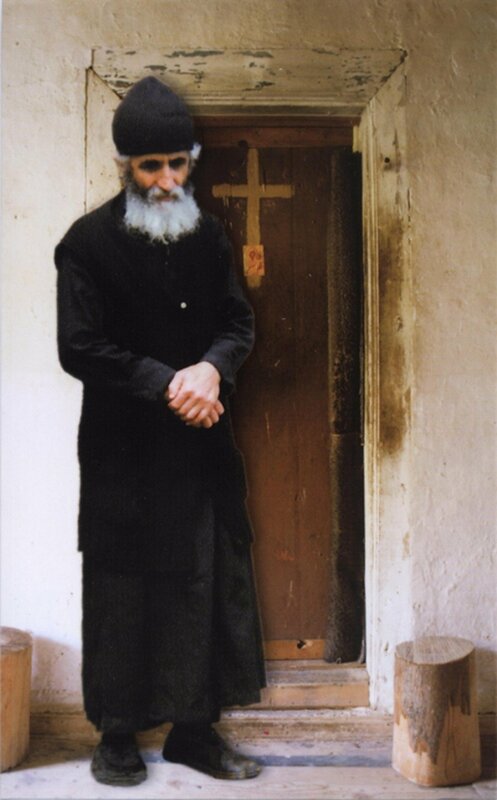 He had lived a life of sin, and lately, he had shut himself inside his house, not wishing to see another human being. Two friends of his - who regularly came to the Holy Mountain - convinced him after many attempts to go along with them to the Holy Mountain, in the hope of bringing him to my Hut. On the trip from the port of Ouranoupolis and until they reached the main port of Daphni, every time the ferry boat came alongside a Monastery mooring, the young man would collapse. His friends, together with the fathers who were also on the boat, strove to revive him by saying the Prayer. It was with great difficulty that they managed to reach the Hut inland. That poor soul opened up his heart to me and told me all about his life. I could see he was being plagued by some kind of demonic influence. I advised him to go to a spiritual father confessor nearby, and do whatever he advises him to do, so he would recover afterwards. He did actually go and confess. When they boarded the ferry boat for the return trip, he told his friends that the spiritual father instructed him to throw away the talisman that he wore (which an acquaintance of his had given him), into the sea. But it was impossible for him to remove it. No matter how much his friends begged him to get up and throw it away, he remained frozen like a statue, unable to get up from his seat. So they grabbed him and with a lot of struggling they led him outside, onto the deck. With the help of his friends, the young man finally managed to remove the talisman and allowed it to drop into the sea - he didn't have the strength to actually toss it overboard. However, he immediately felt his arms had been freed and that his poor tormented body had regained its strength. He began to jump for joy, running up and down the deck, full of life, and testing the strength of his hands on the railings and the sides of the ferry boat. -Elder, do sorcerers acquire some sort of information? -They are informed by the devil, but they also tell many lies. But you yourselves should also pay attention in the refectory. You need to be in control of the situation, see what kind of people enter there, because among them may be a person who is involved with sorcery. Does it sound strange to you? In one of the night-vigils that took place here, there came two individuals who dealt in magic things. They approached the other people and told them all sorts of things. They also lied about being associated with Bishop Kantiotis. They told one of the women: "They have placed a spell on you. We can come to your place and break the spell with a crucifix that we have." So you see, they actually come along to night-vigils, they talk a little spiritually, and the others simply assume "well, if they have come to the night-vigil and speak spiritually, they must be faithful people" and they proceed to open up their hearts to them. How they manage to fool people with the lies they tell! In an attempt to seduce a young woman, this man went up to her and said: "Father Paisios saw a vision that I will marry you; here, take this token, without examining what it is exactly" and he gave her something that was magic, but she fortunately didn't wear it. She only exclaimed: "Is this the kind of thing that Paisios concerns himself with?" and she proceeded to write me a letter - four whole pages long, densely written and full of abusive language. Such abuse! "That's alright" I replied, "swear at me as much as you like. It's worth it, just knowing that you weren't fooled into wearing that satanic article!" -Did she know you, Elder? -No, she didn't know me. And I didn't know them either - not her, nor that man..
-Elder, what did you tell the students who came today and told you that they had invoked a spirit? -What could I tell them? I first gave them a good earful! What they did was a denial of the faith. From the moment that they invoked the devil and accepted him, they denied God. That's why I told them that, to begin with, they should go and confess everything with sincerity, and from now on to take care and go to church regularly and receive Holy Communion with the blessing of their spiritual father in order to be purged. They had extenuating circumstances, because they are youngsters and they did it because they saw it as a game. If they were older, they would have been severely harmed; the devil would have acquired immense power over them. Nevertheless, they are still being shaken by the devil. -What exactly did they do, Elder? -What many others do. They place a glass of water on a table, and they position the letters of the alphabet around the glass... A..B..C.. etc. Then they dip their finger in the water and they invoke the spirit - that is, the devil. The glass then moves around, and it stops in front of consecutive letters and forms words. They invoked the spirit, so, when it arrived, they asked it, "Does God exist?" "He doesn't exist!" it replied. "Who are you?" they asked again. "Satan!" it replied. "Does Satan exist?" "He does!" Talk about gross idiocy! God doesn't exist, but the devil does? When they asked it again if God exists, it replied, "Yes, He does". One "yes" and one "no" and the youngsters got confused. That was how God arranged for things to happen, in order to help them. One of the girls in that group was struck by the glass. God permitted this, so that the others would be jolted into realization. Nowadays, there are many who, when wishing to harm another person, resort to "witch doctors" who use waxen voodoo dolls. (5) The sorcerers have turned this into a game. -Elder, what exactly do they do? -They make a doll out of wax, and, when someone asks them to cause harm to a personal enemy - say, for example, to harm his enemy's eyes - they stick a needle into the doll's eyes and repeat the name of the person that they intend to harm, and at the same time utter various spells. And it is a fact, if the targeted person lives a sinful life and does not confess, he will indeed be struck by a demonic force in his eyes. His eyes will feel as though they are being ripped out with an excruciating pain! He will do all sorts of medical exams, but the doctors will not be able to find what the cause is. Do you see what the devil does? He plants scandals. A good person, even if he does know something about someone else, will never say, "So-and-so has harmed you"; instead, he will try to help him. He will advise him, to not make any negative thoughts, but to go to confession and not be afraid. That way, he helps both. Because when the one who intended to cause harm notices that he is being treated with kindness, he will stop to ponder (in the good sense) and will repent. -Elder, can a sorcerer cure a sick person? -A sorcerer? Curing a sick person? If a person is being convulsed by a demon, the sorcerer can "cure" him, by sending the demon to another person. Given that the sorcerer is partners with the devil, he simply says to the devil: "Get out of that person, and go to so-and-so". So the devil removes the demon from that person, but usually sends it to a relative or an acquaintance of that person (who has given leeway to the devil). Then the one who was rid of the demon will say: "I was tormented, but so-and-so (the sorcerer) made me well", thus actually advertising the sorcerer! The demon then ends up entering relatives or acquaintances. However, if a person is hunchbacked on account of sorcery, a sorcerer can rid him of that demon and send it to someone else. But if that person is hunchbacked on account of a physical disability, a sorcerer is not able to cure him. I was told of a woman who supposedly cured sick people with the use of various "holy items". When I heard what she did, I was amazed at the devil's artfulness. She holds a Cross in her hand and chants various troparia (hymns). For example, she chants "Virgin Theotokos", then spits near the Cross (in other words, blasphemes Christ) and that's how the little demon brat helps her. Thus, those who are sick - with depression etc., on account of demonic influences - she could cure them because she would drive out the demon that was causing it, then send it to someone else so that the first victim would be relieved of the depression. And there are many who regard her as a saint! They go to her for help, and gradually, she harms their soul, she destroys them. One needs to be very careful, to keep away from sorcerers and sorcery, the way one would avoid fire and snakes. We should not confuse things: The devil can never do any good. He can only "cure" the sicknesses that he himself provokes. I was told of the following incident: A young man had gotten involved with a certain sorcerer and had begun to dabble in sorcery himself. He was eventually harmed, got sick, and ended up in the hospital. His father spent a lot of money over many months, because at the time, they were not insured. The doctors couldn't understand what was wrong with him. He had become a mess! What did the devil do then? He appeared before him in the guise of Saint John the Baptist (who was the patron saint of the young man's home town) and said to him: "I will make you better, if your father builds a church". The young man told this to his father, and that poor fellow said: "My child, I will give everything I have, as long as you get well" and he made a promise to the Baptist to build a church in his name. The devil departed and the young man recovered; the devil had performed his "miracle"! So the father thinks to himself: "I made a promise to build a church. I must fulfill that promise." Their finances weren't very strong, so, in order to build the church, the father sold all the properties that he had - he gave up his entire fortune. His children were left stranded; they became exasperated, "We can do without Orthodoxy" they said, and went off to become Jehovah's Witnesses. See what the devil does? There weren't any Jehovah's Witnesses in that region, and the devil found a way for them to appear there as well! -Elder, when do spells work? -In order for spells to work, one has to have given rights to the devil. In other words give him a serious reason, and not have put oneself in order with repentance and confession. To a person who confesses, even if spells are shovelled onto him, they won't affect him at all. Because if that person has been to confession and has a cleansed heart, no collaboration whatsoever between sorcerers and the devil is able to harm him. One time, a middle-aged man came to my Hut with a suspicious air about him. From a distance, when I first spotted him, I could tell he was under a demonic influence. "I came here so you can help me", he said. "Pray for me, because I've been having terrible headaches for a whole year, and doctors can't find what's wrong." "You've got a demon", I said to him, "because you've given rights to the devil". "You didn't do anything?" I replied. "Didn't you cheat on a young woman? Well, she went and had a spell put on you. Go and ask her to forgive you, then go to confession, ask to have Exorcisms read over you, and you will regain your health. If you can't perceive your error and don't repent, even if all the spiritual fathers in the world get together and pray for you, the demon won't leave you." When people like him come to me, with such an air, I speak to them openly. They need to be shaken up in order to come to realization. One other man told me that his wife was demon-possessed; that she constantly created a fuss at home. She would get up at night, wake up the others, and turn everything upside-down. "Do you go to confession?" I asked him. "You must surely have given rights to the devil", I said to him. "This couldn't have happened out of nowhere." In the end, we discovered that he had been to a Hodja, who had given him something to sprinkle on his house "for good luck", so that his business would prosper, but he didn't pay any attention to this fact. After that, the devil began wreaking havoc in his home. -If spells do work, Elder, how can they be broken? -With repentance and confession. That's why we must firstly locate the cause that made the spells work; the person must understand the error of his ways, repent and confess. So many people come to my Hut who are terribly tormented because someone has placed spells on them, and they say: "Say a prayer for me, to get rid of this torment!" They ask for my help, without first trying to find where the evil started so that they might correct it. In other words, to discover what their fault was - which caused the spells to work on them - then to repent and confess so that their torment may end. -Elder, when someone who has been put under an evil spell reaches such a state where he can't even help himself - to confess etc. - can others help him ? -They can invite a priest to his home to perform the Holy Unction or read Prayers of Sanctification. They can give him to drink of the holy water so that the evil element can recede a little, and Christ enter inside that person. This is what a mother did for her child and was helped. She had told me that her son suffered immensely, because they had placed him under an evil spell. "He should go to confession", I had advised her. "How can he go, father, to confession, in the condition he's in?" "Then tell your spiritual father to come to your home, to read the Sanctification Prayers and then give your son to drink some of the holy water. But will he drink it?" "He will drink it" she replied. "Well then, begin with the holy water", I suggested, "then try to get the youth to speak to the priest. If he confesses, the priest will kick out the demon." And she did, in fact, heed my advice and the young man was helped. After a while, he was able to go to confession and he recovered. Another woman - poor soul - what do you think she did? Her husband had become involved with sorcerers and didn't even want to wear a Cross on him. To help him somewhat, she sewed a tiny Cross into the lapel of his jacket. Once, when he had to cross a bridge to get to the opposite bank of a river, he heard a voice calling out to him: "Tasso! Tasso! Take off your jacket, and we can cross the bridge together!" Fortunately it was cold, so he said: "Why take it off? I'm cold!" "Take it off! Take it off, so we can cross over!" he heard the same voice calling out to him. That wicked devil! He intended to throw him into the river but was unable to, because he had that tiny Cross on him. He finally threw him down, in another spot on the bridge. In the meantime, his folks were looking for him, all through the night. They found the poor fellow sprawled on the bridge. If it wasn't so cold, he would have taken off his jacket and the devil would have tossed him into the water. He was protected by the Cross that was in his lapel. His poor wife was a strong believer. If she didn't have any faith, would she have done that for him? -Elder, can't a man who has sanctity expose or hinder a sorcerer? -How can he stop him? It's hard enough telling someone who is even a little God-fearing to be careful because the way he is living will not lead to something good; if he won't change his ways, then how much less will the sorcerer who collaborates with the devil? What can you do with him? You could tell him a few things, but he will continue to be with the devil. Only when the sorcerer is in front of you and you say the Prayer, the demon may get confused and the sorcerer will be unable to do his business. There was a person who had a problem, and a sorcerer - who was a big con artist - went to his house in order to help him. The person however was saying the Prayer; he was a simple person - he didn't know that the other man was a sorcerer - and that's why God intervened. And look what God permitted to happen, so that he might realize! The sorcerer began to be beaten by the demons, and he had to cry out for help from the man whose problem he went to solve! -Elder, was that man able to see the demons? -He couldn't see the demons! All he could see was a bizarre sight: the sorcerer crying out for help, tumbling around, falling down, putting his hand up to protect his head. Because don't imagine that sorcerers have it easy; or that the demons always respond to their wishes. It is enough for them that he denied Christ once. At first, sorcerers make a deal with demons to receive their help, and the demons submit to them for a few years. But after a while, they say: "Are we still going to be bothered with you?" Especially if sorcerers don't succeed in doing what the demons want - have you any idea what they suffer afterwards? I remember once, when talking outside my Hut with that young sorcerer from Tibet: he suddenly got up, grabbed my arms and twisted them behind my back, saying: "Now let's see your Chief(6) free you!". "Get the hell away from here!" I said to him, and threw him down. The nerve of him, blaspheming the Saint! He then tried to strike me with his foot, but his foot stopped short of my mouth. God protected me. I left him, and returned to my cell. Then after a while I saw him coming back towards me, covered with thorns. "Satan punished me" he said, "because I didn't defeat you. He dragged me through the shrubs". The black powers of darkness are powerless. People make them powerful with their alienation from God, because that's when they give the devil rights." 1. Initial: superior, master demon. One of the demon leaders. According to the Fathers, demons group together in legions. 4. The 61st Canon of the 6th Ecumenical Synod ordains the excommunication of "Phylakterians" - that is, those who manufacture talismans in which they place demonic symbols or various items (such as hairs, fingernail clippings, snake bones or bat bones etc.) on which they have previously transmitted demonic energy through magical practices. 5. A kind of magic that is exercised during traditional religious worship in Haiti and South America. The term is derived from the word "voodoo", which implies a god or a spirit. 6. Saint Arsenius the Cappadocian. From the book Spiritual Counsels of Elder Paisios of Mount Athos, vol. 3, ch. 1.